The National Oceanic and Atmospheric Administration keeps a tally of "billion dollar disasters" which have occurred in the United States. 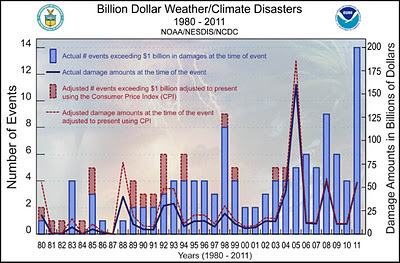 The number of disasters which exceed the billion dollar threshold has increased since 1980. This increase has been often cited as evidence that the climate has become more extreme and is attributable to emissions of carbon dioxide. A new peer-reviewed paper from NOAA pours cold water on both claims. Adam Smith, of NOAA, and Rick Katz, a statistician and former colleague of mine at NCAR, have a paper just out in the journal Natural Hazards in which they take a close look at the index. 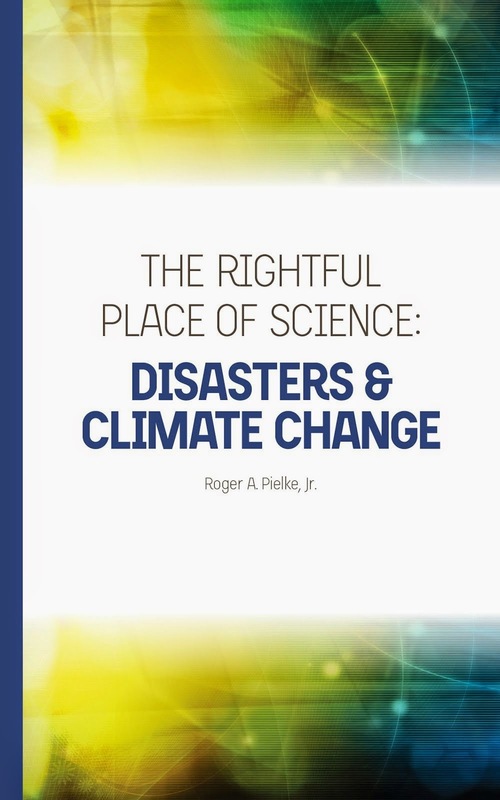 What they find reinforces conclusions found in earlier work on disasters and climate change. Specifically, if you are looking for climate signals in extreme events, look first at climate data. If you are looking at loss data, avoid aggregated, non-normalized loss records. [T]here is no apparent time trend in economic loss from individual disasters. In fact, a least squares trend analysis estimates a very slight decreasing trend of about 0.5 % per year. So they find more events that exceed the billion dollar threshold, but not more severe events. 2. The dataset is dominated by hurricane, drought and thunderstorm losses which together account for more than two thirds of all events and more than 80% of all losses. As readers here will know well, there are no long-term trends in normalized US hurricane losses, North American drought has decreased and there has been no increase in tornado damage (note that thunderstorm damage also includes hail and straightline winds). This alone provides a strong caution to using the NOAA index for purpose of claims about extremes in general. Given the increasing trends in [crop] yields attributable to technological innovation and given fluctuations in price, it is difficult to attribute any part of the trends in losses to climate variations or change, especially in the case of billion-dollar disasters. 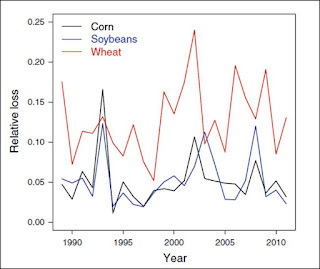 In fact, one of the most important contributions of the paper might be its finding that crop losses have not increased as a proportion of liability (as shown in the figure above from the paper), or as it concludes, "for these three major crops, the trends in losses are comparable in magnitude to the trends in liability." 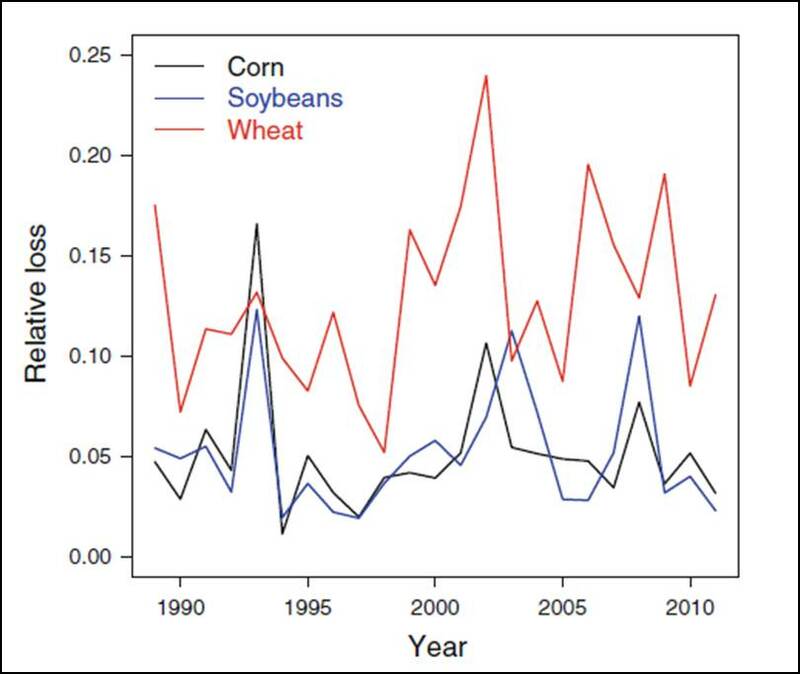 The billion dollar loss dataset includes no adjustments for changes in crop value, yield or other relevant factors, nor does the widely cited Munich Re data. The implication of course is that some significant but unquantified portion of the increase in billion dollar losses reflects non-climatic trends in crop production and value. The magnitude of such increasing trends is greatly diminished when applied to data normalized for exposure (Pielke et al. 2008). Smith and Katz have properly identified the severe limitations to the NOAA billion dollar loss database. Any bets as to whether NOAA will issue a press release as a corrective to its earlier hyping of the index and promoting its misuse? Even if they don't, the new paper is a valuable contribution.